While cost tends to dominate discussions about prescriptions drugs and health care policy, lawmakers probably shouldn’t overlook the economic problems caused by abuse and misuse. 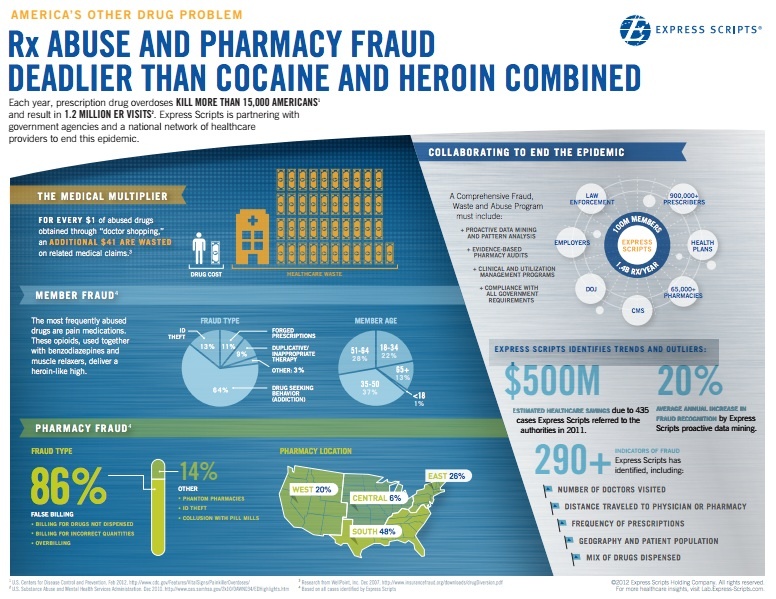 According to prescription-management specialist Express Scripts, people selling or obtaining prescription drugs illegally or not taking them according to the directions combine for more than $500 billion in wasted health care spending each year. But, armed with a boatload of data, Express Scripts is trying to get those problems under control. If Express Scripts’ numbers are correct, the abuse and misuse (which the company calls “nonadherence”) of prescription drugs can have a pretty staggering effect on the health care market. 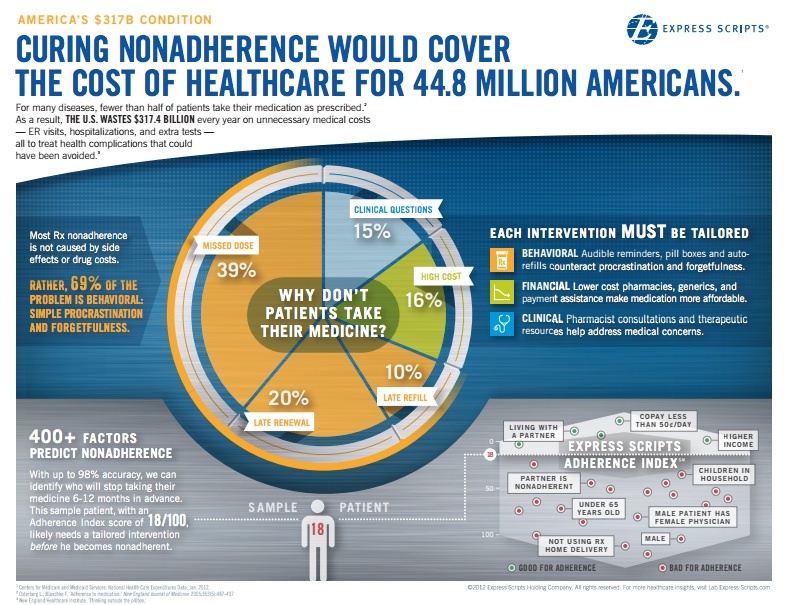 Nonadherence, the company claims, results in expenditures of $317.4 billion a year treating conditions that could have been avoided had people just taken their prescriptions as directed. Every dollar spent on potentially abused drugs results in an additional $41 spent on associated claims, and the health care system loses between 3 and 10 percent of every dollar — or about $224 billion — to fraud and abuse every year. Express Scripts’ strategy for solving the problem is all about data. Because it manages 1.4 billion prescriptions each year covering about 100 million Americans and 65,000 pharmacies, the company is able to identify patterns that signal potential problems. But it’s also using data to try solving some cases before it ever has to spot them. Here’s how Express Scripts does what it does. When it comes to fighting fraud and abuse, there’s not a whole lot anyone can do to stem the tide of issues that cause those behaviors, but data analysis can certainly help flag problems and eliminate them from the system. Having such a large dataset to analyze helps Express Scripts easily spot outliers in patient behavior, explained Michael Klein, a senior manager in the company’s program integrity division. Prescriptions for narcotics, for example, often include limitations on the amount that any given pharmacy can dispense in a month, so individuals addicted to those drugs might seek multiple prescriptions from multiple physicians and try filling them at multiple pharmacies, often geographically distant from one another. In one instance, Express Scripts’ models helped Klein and his team identify a husband-and-wife team that had obtained approximately 7,000 pills — worth about $150,000 in total — by using 17 doctors and pharmacies in different cities. They had actually signed multiple exclusivity contracts with doctors, stating they would only get narcotics prescriptions from those doctors. In another case, an Express Scripts flagged an individual who had received 808 days’ worth of narcotics in one year, with the pills spread across 21 pharmacies, 19 doctors and multiple schedule 2 controlled substances. And where there’s addiction, there will always be people trying to make a buck by feeding it. Although the number of individuals abusing prescription drugs or trying to defraud the system to make money is a difficult problem to tackle in terms of sheer scale, Klein noted, there’s an equally important problem around what he calls “pill mills.” As the name term implies, these are essentially doctors who overprescribe medication. “A line of people … go into their office and they just write those prescriptions,” Klein explained. Express Scripts uses its models to track doctors’ prescription activity across its entire network of pharmacies and patients, but a sheer quantity of prescriptions or even dosage doesn’t necessarily prove there’s anything insiduous going on. Rather, Klein said, the company also looks at things such as the types of medications they’re prescribing and even what people are saying about doctors online. If a doctor’s behavior raises a red flag, there’s a chance — surprisingly high, in fact — that he or she has been mentioned on an online forum as a good person to see if you need drugs. Jo-Ellen Abou Nader, a senior director for program integrity at Express Scripts, noted that, much like with other criminal networks, identifying one member in a pill mill scheme can help uncover a much bigger picture. One particularly high-profile case involved a single doctor prescribing an average of 55 pills per day to 30 patients over the course of a year — that’s an average of 20,000 apiece and more than 600,000 in total. That’s more than anyone could ever take, she said, and just flagging one of those recipients could be enough to expose the entire operation. However, not everyone prescribing too much medication is trying to profit from the system, and not everyone trying to profit from the system is involved with dealing drugs. Abou Nader explained that Express Scripts has models to flag Medicare Part D fraud, in which people sell Medicare IDs to pharmacies that then issue claims for pills they never dispensed, as well as plain old waste. The latter, which the company defines as “overfilling,” can look like small-scale fraud, she said, only doctors or pharmacies are unintentionally doling out too much medication. As big of a problem as waste, fraud and abuse combine to be, nonadherence is an even bigger problem in terms of extra costs. According to Bob Nease, chief scientist at Express Scripts, people who don’t properly take their prescriptions make up a more-expensive medical condition than heart disease, cancer and diabetes combined. “Those are the statistics we tell to scare people,” he said. This is somewhat problematic because it can be difficult to tell the difference between someone who takes their pills regularly but just forgot to refill on time and someone who consistently skips days altogether. So what Nease would really like to see is a way to incorporate sensors into the prescription process, perhaps like a Bluetooth-enabled cap could that communicate with a person’s smartphone to alert him if he hasn’t opened the bottle today or that it’s time to take medicine (GlowCaps are probably a good starting point). Sensors that measure weight or volume could give people like Nease a better sense of when people are taking medicine and how much they’re taking. It’s this latter type of information — how actual medication-taking behavior relates to improvements or deteriorations in health — that Nease really wants to know. Express Scripts uses the FDA definition of “adherence,” which means taking medication as prescribed 80 percent of the time, but Nease says no one really knows the difference between someone moving from 50 percent to 60 percent adherence or from 70 percent to 80 percent. For some conditions, he posited, small improvements might actually be medically significant even if the patient never approaches that 80 percent threshold. But for now, Express Scripts relies pretty heavily on models that Nease said are more than 90 percent accurate at predicting whether someone will get lax on following directions. Most people who are nonadherent will naturally become more adherent over time (and vice versa), Nease said, with rates waning and waxing by about 20 percent. Using simple methods such as beepers that go off when it’s time to take a medication or bottles that remind someone whether or not they’ve taken their medication, people who Express Scripts predict have a mid-range probability of nonadherence see their adherence rates rise an additional 14 percent on average. Those models turn out to be pretty interesting, however, taking into account some 400 variables including classic demographic information, the types and numbers of prescriptions someone is getting, and even whether people respond to Express Scripts’ letters and phone calls. And although no single variable has too big an effect on its own, how they interact with each other turns out to be rather important. For example, Nease explained, the patient’s gender and doctor’s gender can be relatively telling depending on the patient’s ZIP code. Male patients living in lower-income areas and seeing female doctors tend to have higher nonadherence rates than do otherwise similar patients in higher-income areas. Feature image courtesy of Shutterstock user pogonici. Doctor shoppers are easier to catch via analytics such as that described above. A single identity visiting multiple clinics/pharmacies will be flagged. The smart pill rings have shifted to a flat structure – renting insurance benefits for a central pool, combined with fake IDs and acting. Beneficiary fraud with the highest arbitrage windfall.